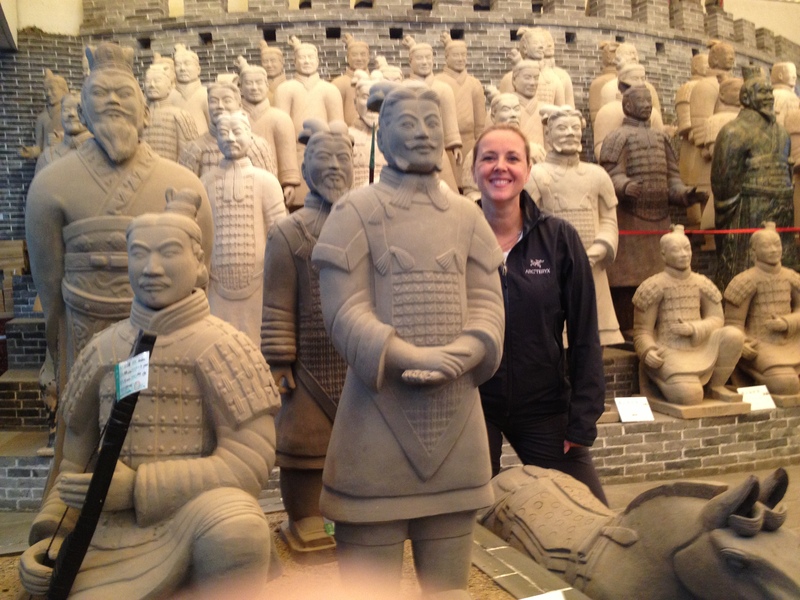 From Beijing, we moved by overnight train to Xi’an, the capital of the Shaanxi province located in the middle of China and one of country’s oldest cities (Xi’an is one of China’s four Great Ancient Capitals). The kids were quite excited to go per sleeper train (about 12 hours) – although the arrangements were rather small (2 tiny bunk beds) and a little cramped for my long Dutch legs – it was a great first, overnight train experience (the train is really a great way to see the beautiful and interesting countryside!). 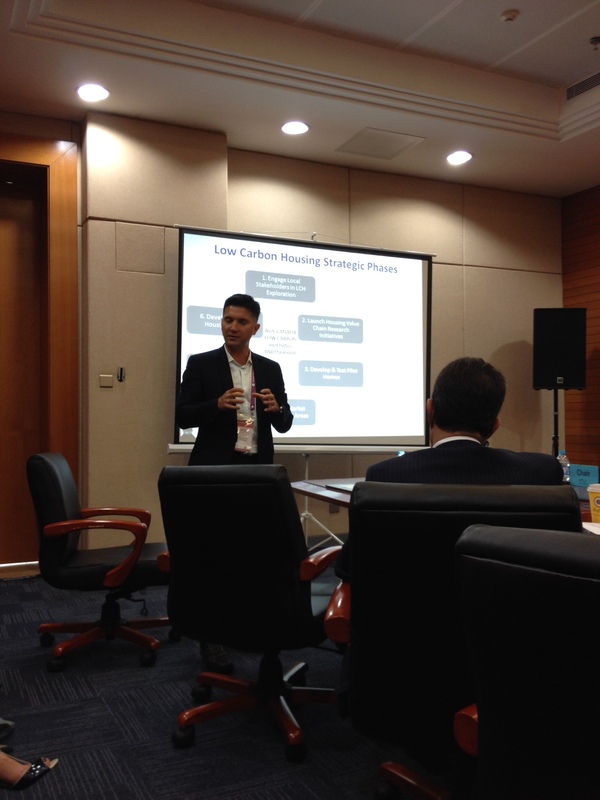 Anthony was invited to speak at the EuroAsia Economic Forum in Xi’an where he was presenting on Innovolve’s exciting low carbon housing work in Latin America. 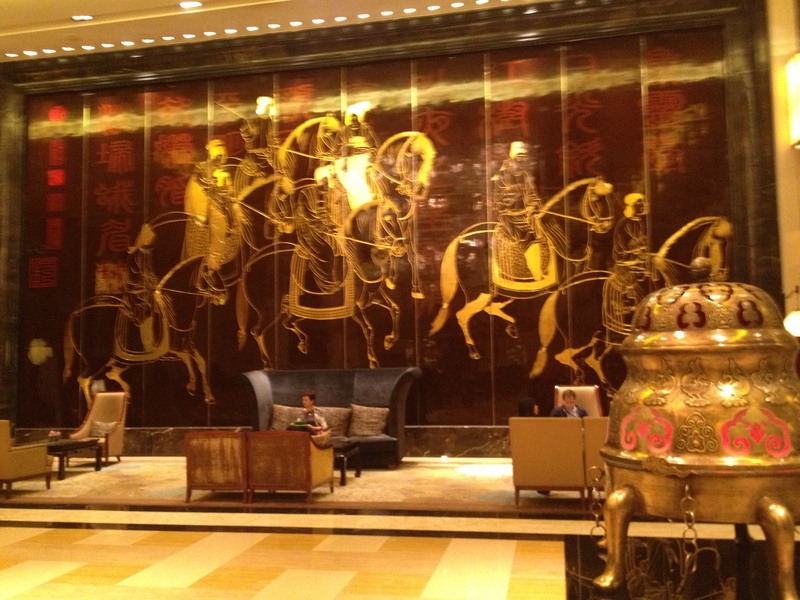 As part of the conference we were staying at the luxurious 5-star Hilton Xi’an (http://www3.hilton.com/en/hotels/china/hilton-xian-XIYHIHI/index.html). To have super comfortable beds (with 5 choices of pillows), fluffy bathrobes, a bath to soak in and a beautiful swimming pool and hot tub, were real treats after several nights in hard bunk beds. 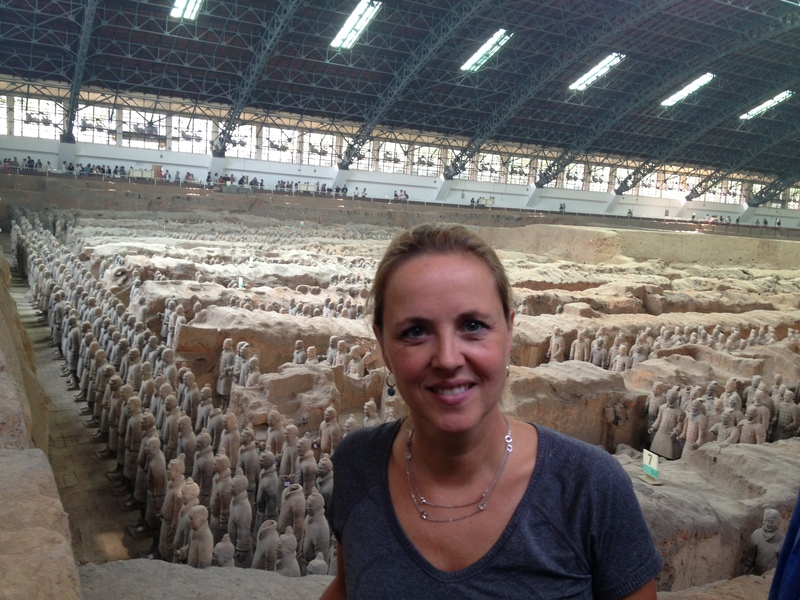 Our first day, we were offered a complimentary conference tour of the Terra Cotta Warriors Factory. We misunderstood, as we thought we were going to the coveted museum & site– and we probably would have skipped this tourist trap – but in the end is was quite interesting to visit the place where they make the beautiful replicas of these world famous warriors (the ladies who make the replicas go through years of ceramic studies!). 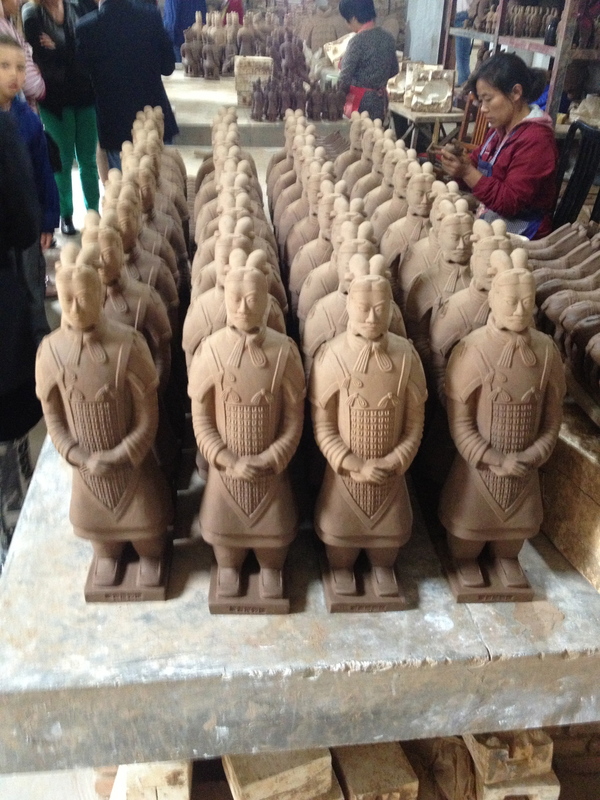 Apparently, the replica statues are made from the same clay as the real warriors in the ground and full life-size ones can take up to a year to make (and yes….we were weak, couldn’t resist– a nice, small copy of a Warrior General is being shipped to Canada – we hope this souvenir will arrive in one piece!). 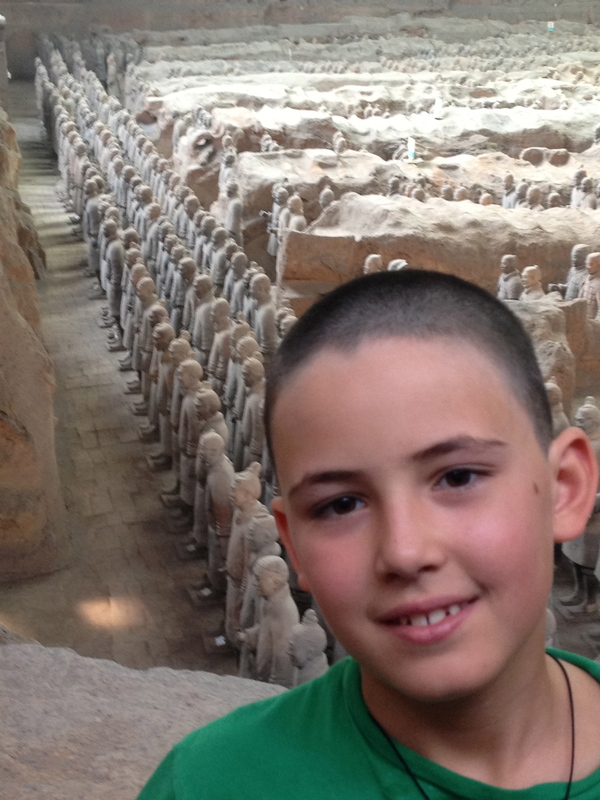 The real Terra Cotta Warriors site is of course the main reason why many visit Xi’an and we were also quite excited to explore this phenomenon. In 1974, farmer Yang Zhifa found a piece of old terracotta as he was digging a well. 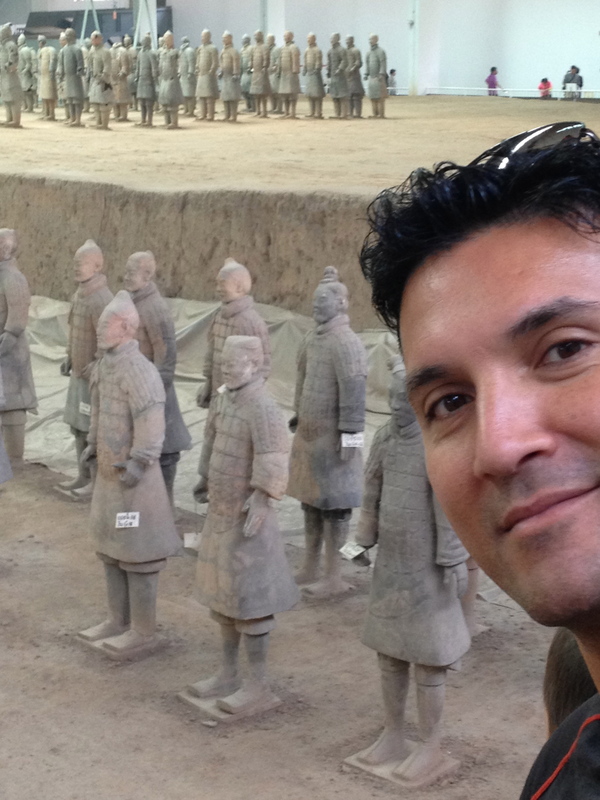 What he dug up was the first warrior of the now world-famous Chinese Terracotta Army (a selection of 2000 year-old Qin warriors, chariots and horses depicting the armies of Qin Shi Huang, the first Emperor of China). It was absolutely incredible to visit this impressive, large historical site that has now turned into a must-see museum. When you enter the complex, you walk into a large Pit (they have about 3 pits in total). Pit 1 is the largest excavation pit of the Army and the most impressive one – it is also the easiest one to see as it is the only one in bright light (some of the warriors were found with colours on them – red, blue, black & yellow tints – that disappeared when dug up and exposed to light. Therefore, Pits 2 & 3 can now only be seen in darkness). In the Pits, we saw the warriors still in the clay and surrounded by the walls they were found in – several of them in full condition – while others are mere fragments of horses, warriors and wheels of chariots. 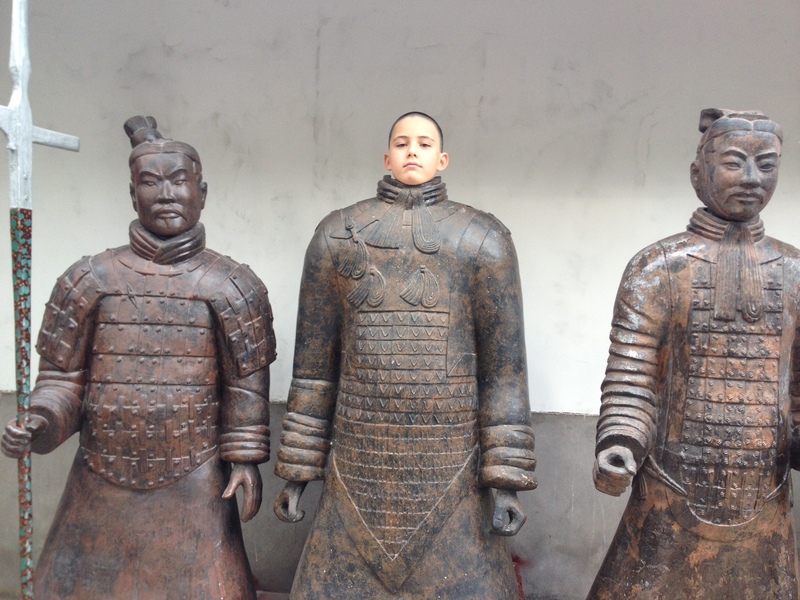 The figures vary in height and dress according to their roles (the largest and most impressive being the general). It was truly mind-blowing! Our guide told us one funny story about the farmer who found this historic treasure. When Bill Clinton came to visit Xi’an and wanted to meet the farmer who dug up the national treasure, the Chinese government prepped him to say a few word in English. “How are you”? “Thank you” and “Me too”. When the farmer met the former US President, he was so nervous that he said; WHO are you, instead of HOW are you. So Bill said: “I am Bill Clinton, President of the United States”. The farmer was confused as he expected “I am fine” in answer to HOW are you – so he asked again: “WHO are you”?, so Bill said: ”I am Bill, husband of Hillary Clinton”. So the farmer answered: ME TOO! Everyone had a good laugh and the Chinese still to this day, very much like Bill Clinton who was quite amused by the whole thing! 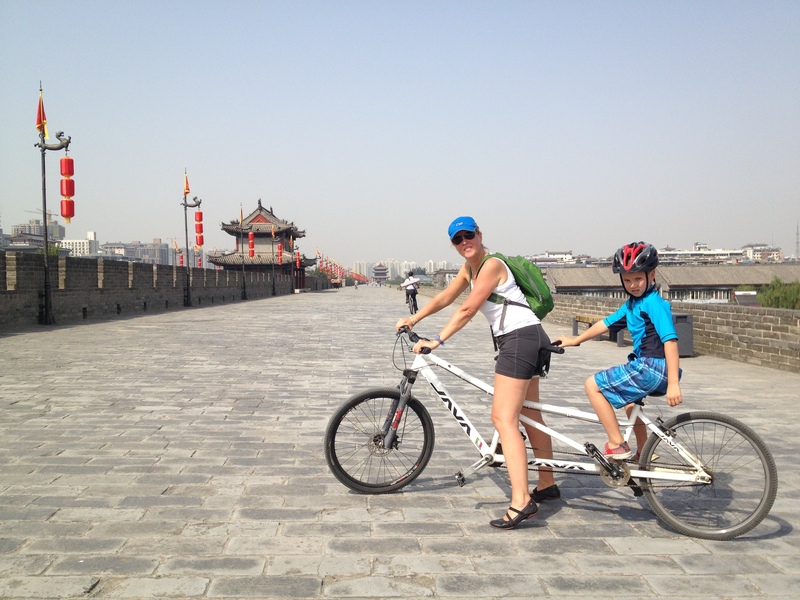 The children were also quite amused when I rented some bikes with them (Filou and I on a tandem) and we rode 1.4 km on the ancient city wall of Xi’an. 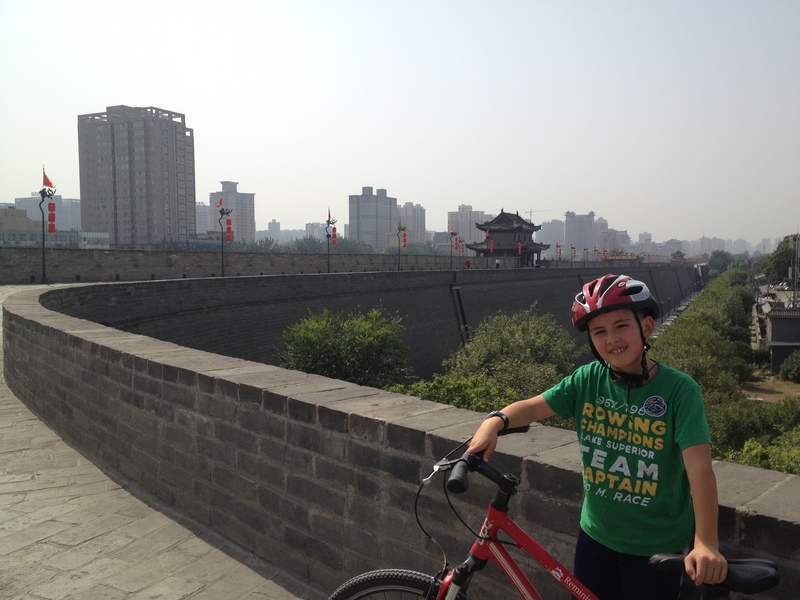 This beautiful, ancient wall that surrounds the core of Xi’an is the most complete city wall that has survived in China. It was quite special to ride on top of this beautiful piece of architecture – but it has to be said that the ride was quite a bit more challenging and longer then we expected (it was also incredibly hot). But we are troopers and the views both inside and outside the city wall were worth it. The bikes were not like good solid Dutch bikes though and we had some nice red behinds and hands to show for our adventure! On our way back from our bike tour, we walked passed several locals selling various pieces of jade, local rocks and coins. Filou was absolutely thrilled to find a small piece of Jade and Emile was super happy to add an old Chinese coin to his collection. We found a very sweet Chinese lady who made the beautiful pieces into a necklace that the boys don’t seem to want to take off (Filou has learned that Jade is as valuable in China as diamonds are in Canada so he feels that he is walking around with a diamond around his neck – so precious!). So with “diamonds” around our neck we left Xi’an and headed for the airport to make our flight down south to the mountain retreat of Yangshuo. 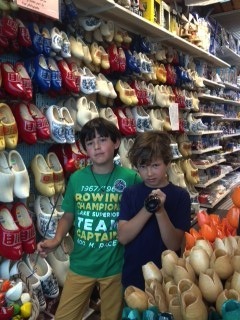 Emile and Filou have had a blast in the Netherlands! 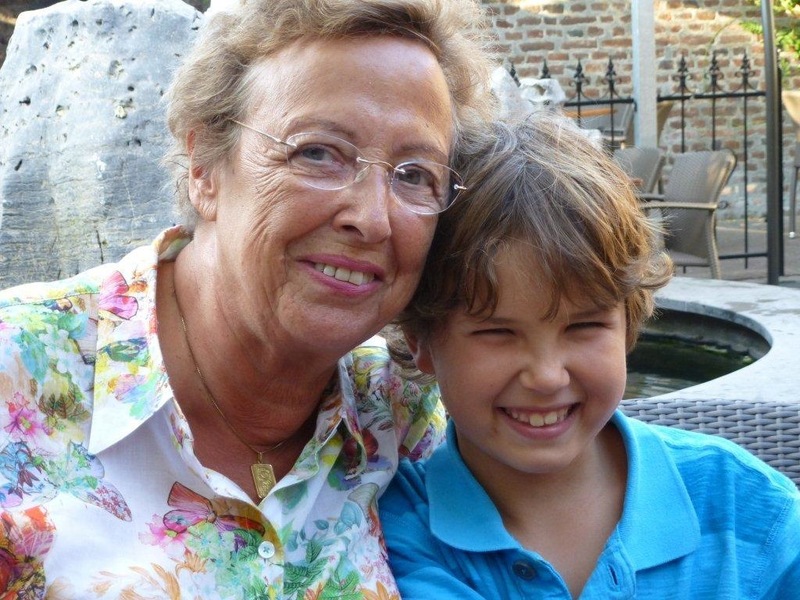 In our second week, we moved to the North-East province of Drenthe, and got treated by Opa and Oma to a fabulous week at Landal Green Parks “Hof van Saksen”. This park is completely set-up for families, and provides children with the opportunity to experience something new and exciting every day. The boys built huts out of discarded crates, did target practice with a bow and arrow, spent an afternoon wood crafting and made a beautiful wooden horse and seal for their Opa and Oma, raced across the lake on self-made rafts, had dinner by themselves in the children’s restaurant, cycled around the beautiful surroundings (paths that led them through gorgeous forests and farmlands), saw the inside of a working windmill, fished, and must have gone a 100 times down the amazing water slide this resort offers (http://www.hofvansaksen.com/gb-en/holiday-park/the-netherlands/drenthe/hof-van-saksen). 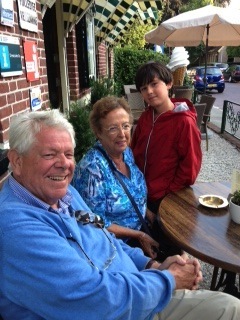 What an amazing time to have spent with their grandparents, who enjoyed every minute of their time with the boys. 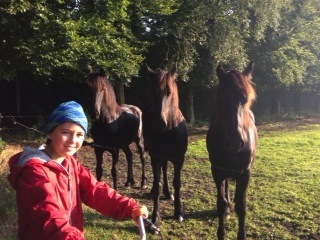 Emile biking through the Dutch countryside and making friends! 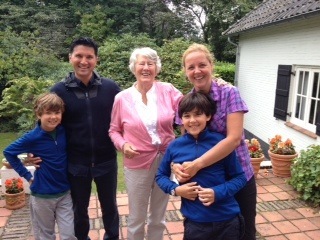 Then it was onto my BFF (best friend forever), Frédérique who lives, with her husband Frank and three children (Bregje, Ted and Huub) in a gorgeous bungalow with spectacular garden in Oisterwijk, in the province of Noord-Brabant – very close to where I grew up. 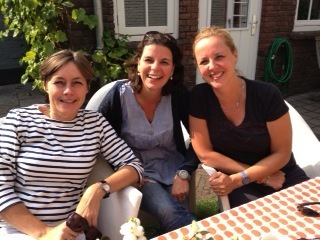 With good friends, you just pick up where you’ve left off, and so too in this case…It was “ouderwets gezellig” (this one is hard to translate! – but basically means that we had the same kind of fun like in the good old days). 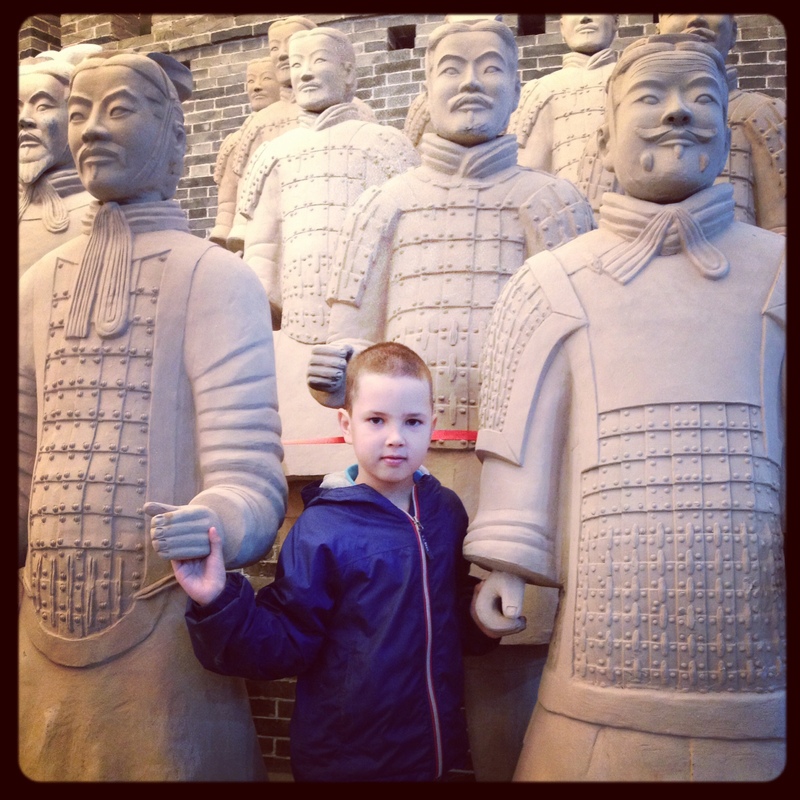 Our first full day together was Emile’s 10th birthday – so to celebrate his double-digit status in a big way, we headed to “The Efteling” – one of Holland’s most spectacular amusement parks. When I was growing up, we went to the Efteling, for its amazing “sprookjespark” (fairytale park), but after all these years it has evolved into a real amusement paradise with shows and thrilling rides (with one ride – The Flying Dutchman – that Frederique encouraged me to try – although she knows rides are not my thing. And so, I hung on for dear life – as this ride went up-side-down and through the water at very high speeds– I had my eyes closed the whole time and it still has my knees shaking, just thinking about it!). 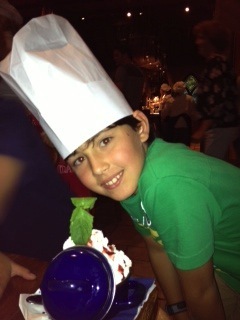 But the day ended well, as we sang happy birthday for Emile while enjoying a delicious Dutch “Pannekoek” (pancake) in a fabulous pancake house (appropriately named the “Globetrotter Restaurant”)– a beautifully decorated place where Emile was invited into the kitchen to create his own birthday ice cream dessert – which was eaten with a chef’s hat on, and big smile on his face. 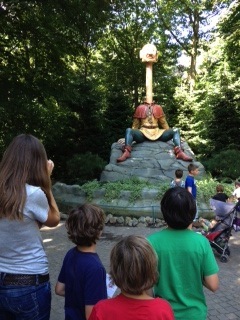 The kids enjoying the fairytale park at the Efteling, seeing “Lange Jan” (Jan with its long neck). 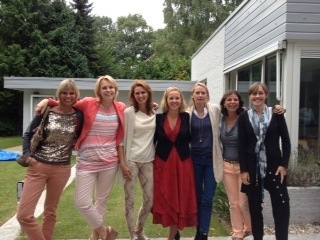 The next day was Friends’ Reunion Day and my dearest high school friends (Karen, Leteke, Anoek, Frédérique, Yvette, Ingeborgh, Dorien, Nathalie & Wim with partners and children) gathered for a wonderful afternoon of catching up and barbeque. It was kind of surreal seeing some of these friends again, as for some it had been over 20 years. It was interesting to notice that personalities really don’t change much over time, and that they are still the same fun, outgoing people that I used to love hanging out with. Moreover, they must have good Dutch genes because the aging process really hasn’t affected them much (judge for yourself but as you can see from the picture below– still a great looking bunch). And although everyone came to see “the Canadians”, it was as much a nice re-connect for everyone present – and I am grateful that our family could be the instigator to gather such an amazing group of friends again. 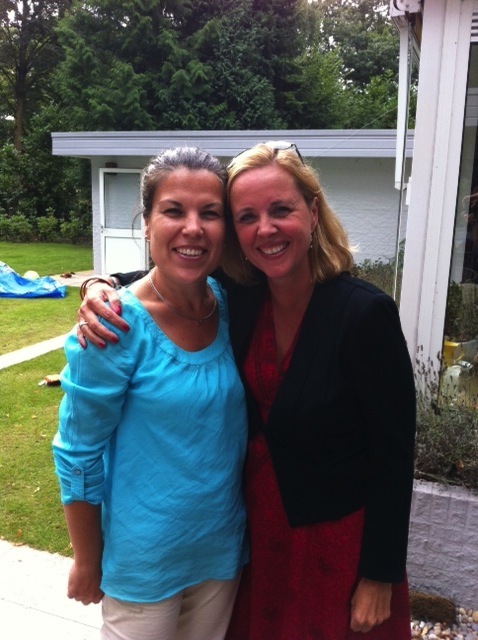 Thanks bunches to Frédérique and Frank for hosting this very memorable afternoon – you are fabulous hosts & friends! 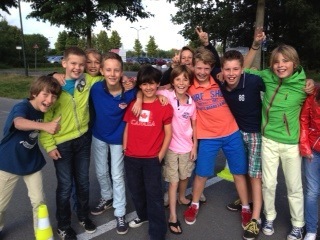 The next day, Emile and Filou were invited to Ted’s class to share their world tour experience – Emile happily answered the many, interesting questions posed (with a bit of mom’s translating help) – and as a result, now has more Instagram followers and friends. 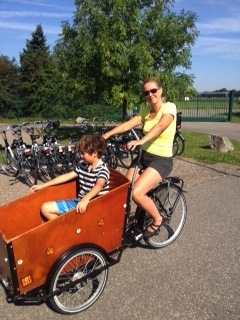 It was great to see that youth activities in Holland have not changed much, and that our boys enjoyed doing the same kind of things with Frédérique’s children as I used to love doing as a child. Filou was delighted to gather frogs in a pond by the house, with Huub and his friends. 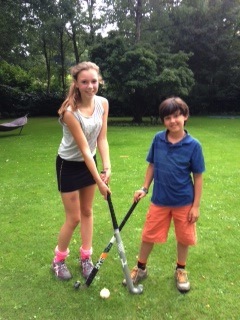 Emile loved seeing Bregje play a field hockey game (a sport I used to LOVE playing!!) – she even gave him a quick first lesson. And at the schoolyard of Ted’s school, Filou was corralled into playing “touwtje springen” with the girls – a fun jumping rope game, I spent hours doing at his age. And even my old neigbourhood in Berkel-Enschot hasn’t changed much – the house I grew up in on the Panislaan – was the same I remembered it (although perhaps a bit smaller in reality then I had remembered it as a child). Being in my old hood, a stop at Auntie Claar’s house was inevitable and fun (such a sweet lady; a best friend of my parents, I used to spent hours playing at her house). 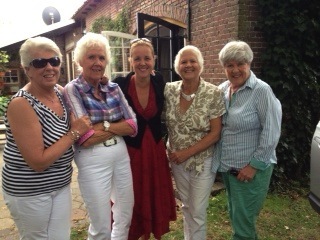 Then, we made a quick stop to visit the “Golden Girls”; my sweet aunties Grietje, Jetty, Else & Anneke. A delicious sandwich lunch was catered by Else and her husband Edwin in the backyard of their beautiful farmhouse in Biest-Houthakker. The kids loved the surroundings (picking fresh apples from the trees, and getting farm fresh eggs from the chickens). What a nice-catch up with these very fun ladies that despite their health and other challenges see life so beautifully and have a great deal of fun & laughs! After a few more wonderful days in Maastricht with Opa and Oma, where Emile and Filou visited the very impressive American War Cemetry in Magraaten, enjoyed swimming in a new, local pool, and strolled around this beautiful walled city, it was onto s’Hertogenbosch to visit our good friends Anoek & Sjoerd and their wonderful, smiley daughters Jip and Cato. A fabulous weekend that consisted of nice country walks, field hockey, dance parties, lots of good food, drink and chats and reminiscing over old high school pictures. 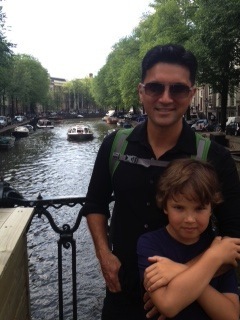 A perfect ending to an amazing time in Holland! 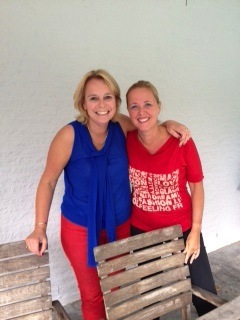 Thanks Anoek & Sjoerd for your wonderful hospitality! With some sadness, I say goodbye to “my country” and my trip down memory lane. 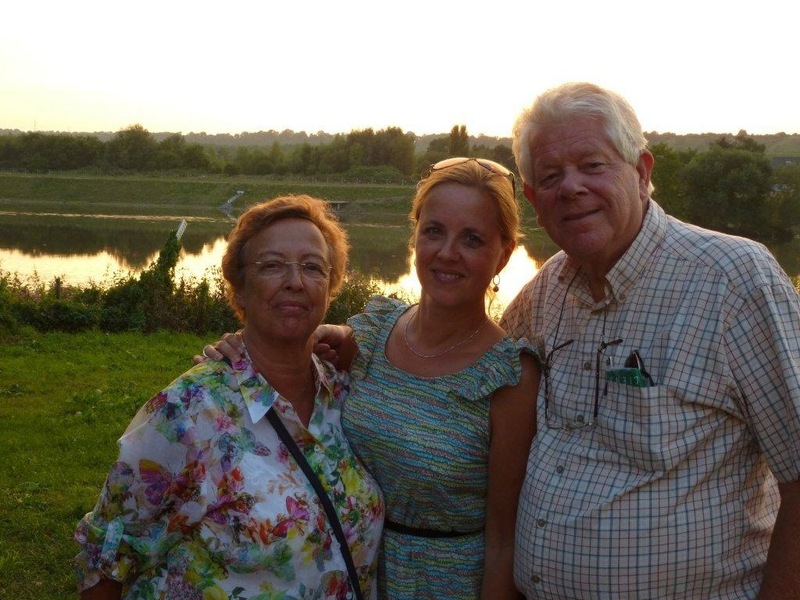 To my dear parents – It was a wonderful occasion to celebrate your 75th birthday; a huge thank-you for this amazing vacation. 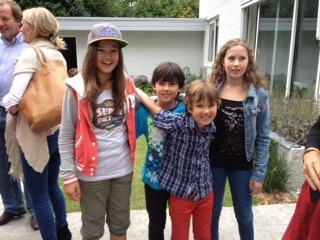 It was priceless to see your laughs and interactions with Emile & Filou! 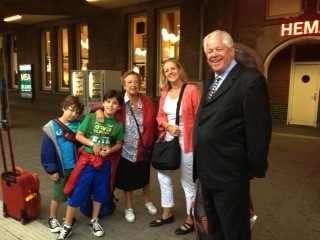 And to my dear Dutch friends & family – you have made this leg of our tour unforgettable and so fun! 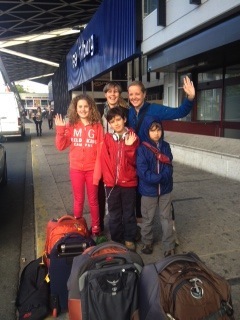 We will miss you all. Tot de volgende keer dan maar weer! Netherlands, or Holland as we “Dutchies” call our country, is an interesting place to observe through the eyes of my children. Having lived here for the first 20 years of my life, it still feels “normal” to me, the way certain things are done – however now they make me ponder as Emile & Filou point things out. 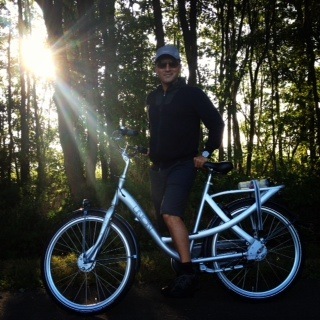 For example, we rented some bikes to take a ride through the Dutch dunes (dunes are the hills that protect Holland against the water) – and when picking up our rental bikes, we were not offered a helmet (something that is unheard of in Canada – especially for children). 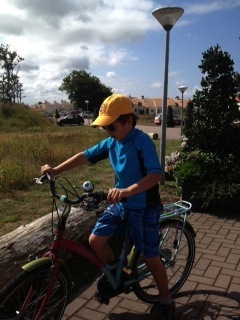 Nobody in Holland wears a helmet (except on a road bike maybe). As a child I would bike 45 minutes to school and back, each day amidst large groups of children – rain, (lots of wind) or shine. It was fun (I always had red cheeks – “appelwangen”) and I never felt unsafe. This is of course because the Dutch have this amazing network of bike paths that are completely separate from the roadways. Emile also found it funny how you lock a Dutch bike – the bikes have a lock attached them, and once you pull a lever down and take out your key, it’s locked and you can leave your bike (Anthony was worried we didn’t have a strong cable to attach it to some solid structure). But it all seems to work just fine here. 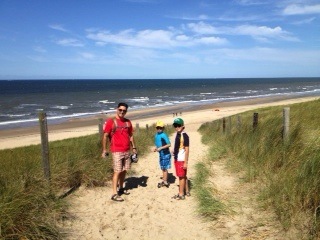 So, after a nice, 1 hour bike ride through the dunes and nature reserve surrounding Noordwijk (we saw a large group of deer and an incredibly large, white snail that caught Emile’s attention)– against, some typical, strong Dutch wind, we reached “het strand” (the beach), where we locked up our bikes, Dutch style, and hiked 5 minutes over a dune, to reach the North Sea. Emile and Filou had a blast jumping in very high waves, and even Anthony braved the somewhat cold water. Like in Canada, water is of course plentiful in Holland, and a trip down memory lane was a visit to the sailing school I frequented as a child. 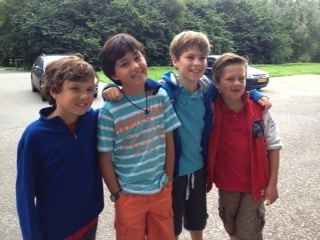 Similar to summer camps in Canada, Dutch kids often go to sailing camp for a week. 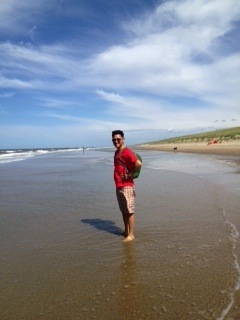 “De Wijde Aa”, was the name of one of such sailing camps, a place where I hold fond memories. This camp, located in Roelofarendsveen, has its own windmill where we slept at night, and a variety of small boats, used to teach us the intricacies of manoeuvering Dutch winds. This sailing camp was educational but mostly very fun with its multitude of different games, activities and songs. The sailing instructors (usually university students) knew how to make it a good time for all. One of those instructors in particular left a big impression on this little Dutchie; he was very handsome and incredibly kind and fun with the kids (I remember him making a song about me and my blue hat – I was always wearing this bright blue hat at camp). A little girl crush, on a guy that I thought had the most beautiful name: Emile. So, ever since then, I told myself that if I had a son, I would call him Emile. 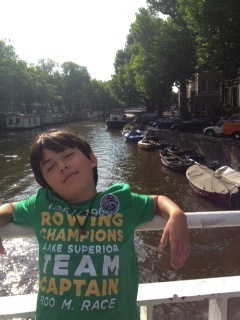 And so, here I was, with my handsome, firstborn Emile, at the sailing school that inspired his name – very sweet! 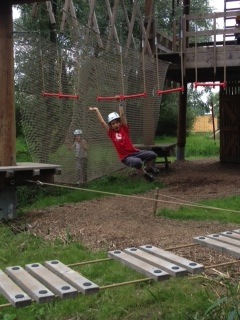 (the only thing missing perhaps was the handsome instructor Emile – probably now in his 50’s or 60’s. J). 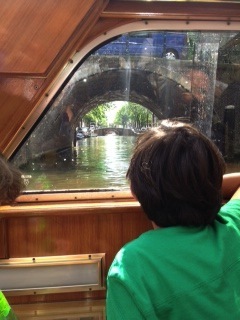 We continued our exploration on the water and took a nice boat ride through the canals of Amsterdam with the family. The canal houses are so unique and intricate in their design, and boating through the extensive network of waterways in the capital city is a lovely way to explore this “Venice of the North”. Our good friend Pieter Tol, who we had the pleasure of connecting with while there, lives in one of those beautiful canal houses overlooking the water. These houses were built deep but very narrow with incredibly steep staircases (I was completely out of breath getting myself to his 3rd.floor apartment), as in the Golden Age, taxes were to be paid on the width of the houses. Now, they are protected and a precious commodity, where each floor is sold or rented separately. Also, fun in Amsterdam was the flower market where you can buy any kind of flower bulb (the kids were surprised at the many different colours of tulips – they produce any colour or mix of colour, you can imagine – even a totally black one!). 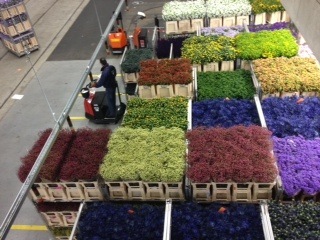 But the most interesting place to learn about the amazing flowers of Holland is the Aalsmeer Flower Auction or Flora Holland (http://www.floraholland.com/en/), in the city of Aalsmeer (for a few euros you can watch the auction, but be there at 7 am for the best show. At 9:00 am it is all over!). Every day, thousands of the most beautiful flowers and plants are auctioned off here to wholesalers and export companies – that for 80% will distribute and sell them worldwide. It is amazing to see the incredible sea of coulours – one flower more beautiful than the other. Once the flowers are auctioned off, and sold, they are transported on the floor, from one location to the next by hundreds of people on “stand up electronic bikes”. Although the process at the auction is highly computerized, it is interesting to notice that it also still needs a lot of human intervention. Of course, I knew Holland was a flower land and we always enjoyed a multitude of fresh flowers and plants at home, but I had never been to this auction which gave me a whole new appreciation for its scale – and reason for which Holland is so famous.